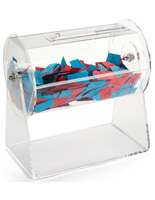 Looking for a fun and exciting way to pick winners for a contest or sweepstakes? 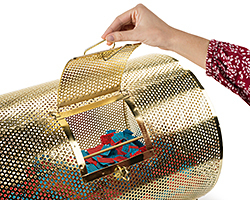 Raffle drums are just the ticket thanks to their live, spinning action. With models available in clear acrylic or stamped metal, let the sights and sounds of these crowd-pleasers make your event even more memorable! 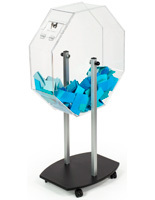 Shopping for raffle drums, also known as ticket tumblers, doesn't need to be difficult. We sell large and small styles in a nice variety of designs as well as the tickets and entry forms that go with them. There is something rather mesmerizing about a spinning tumbler, especially for players anticipating their number being called out. 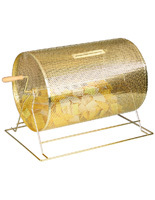 Moreover, raffle drums support any live event with promotional flair. 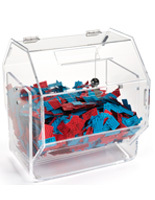 What are some of the popular uses for ticket tumblers? Rally a crowd at trade shows by hosting prize giveaways. Boost employee morale and camaraderie at office parties. Organize fundraisers for your local club. Manage bingo games with hand drawn bingo balls. Let's talk about the different styles that are available. Drums fabricated from perforated metal with shiny brass finish look especially enticing when placed on a table or counter. Perforated holes allow the contents to be seen while they spin round and round. We sell a small and a large version based on the same design and proportion, with capacities reaching 1,000 and 10,000 tickets, respectively. Entries are inserted through the thin card slot located on one side while the access door is directly opposite. The drums are attached to a metal stand and each come with a smooth turning handle to facilitate mixing. 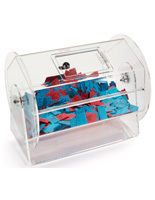 Acrylic plastic raffle drums are the "CLEAR" choice for events. Allowing an unobstructed view of the contents, these tumblers look very impressive and professional. We stock hexagonal and octagonal models in a number of sizes ranging from 16" to 30" in width. The super-smooth spinning action is effortless and quiet. 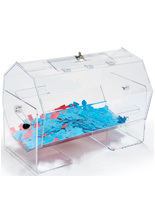 Constructed from 3/16" thick acrylic plastic, the drums also feature machine polished edges for a fabulous presentation, sure to be a hit with event attendees. Thin slots (some feature magnetic sliders) provide a quick and easy way to insert tickets, while hinged access doors with keyed locks offer added security. Each model comes with rubber bumpers on the base to minimize vibration and protect the tabletop surface. 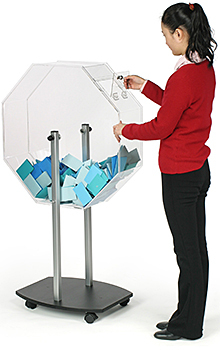 The tumbler's clear design provides an entertaining display for viewers as they watch their entries spin around. Most styles offered are for tabletop or counter use, but we also sell a floor-standing model that definitely makes an impression. Featuring a massive 9" wide x 29.5" diameter spinning drum, this floor stand is an excellent choice for larger drawings that use entry forms. Extruded aluminum poles support the tumbler and wheels beneath the base allow easy mobility when transporting. A locking pin is included to hold the drum in place if so desired. What good is a drawing or fundraiser without the tickets? 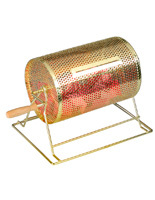 We also offer entry forms and traditional red ticket supplies for all your raffle events. The former comes with a simple generic layout that records a person's contact information, usually used as lead forms people fill out in order to request more information about your business. 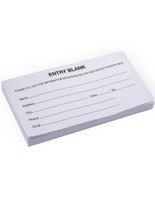 Surprisingly, these basic entry forms (100 per pad) are hard to find online and our customers appreciate the fact they can purchase generic forms without any extra, unnecessary content they don't need. 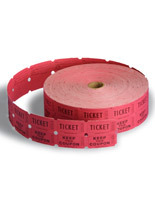 Standard red raffle tickets are sold in rolls of 2000 in a dual row design, meaning there are two stubs with the same numbers: one goes into the drum while the other stays with the event goer to prove they hold the winning number. Purchasing a polished brass roll stand as an added accessory aids in dispensing. 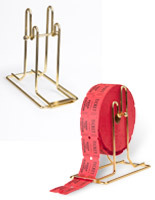 The roll is supported by a brass bar while the tickets are fed through a slot at the bottom. Not only does this make tearing off tickets easier, it also adds professionalism to your fundraising table. We offer other trade show gaming accessories that can improve company awareness and brand recognition. 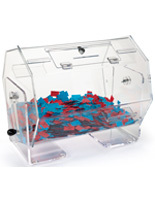 Disc drop game boards, bingo games, and spin-to-win wheels are a great way to reel in a crowd with the loud and exciting noises these displays make. A large crowd in front of any booth is always good for business and can help draw in more people. Customers will associate the positive feeling of winning with your brand and will take that feeling away from the trade show.